2G, 3G & 4G global or regional coverage with access to hundreds of roaming deals in over 190 countries. No complex contracts, commitments or hidden fees, pay for actual data consumed. Plus, cancel your subscription at any time with no extra charges. 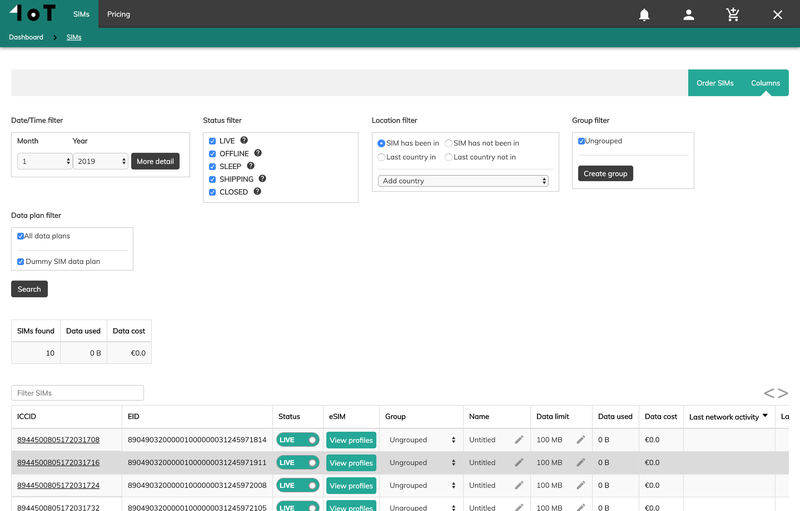 Control your SIMs unitedly from 1oT Terminal or API - a self-service platform for managing connectivity and subscriptions to tons of value added services. We support 2FF (mini), 3FF (micro), 4FF (nano), and solderable MFF2 (VQFN-8) SIMs. Tested on hundreds of cellular modules and hundreds of thousands of IoT devices. Technically known as UICC, the traditional SIM card enables you to connect your IoT devices across 2G, 3G & 4G technology. We're your connectivity department. Not just your carrier. We are trusted by many mobile network carriers worldwide. 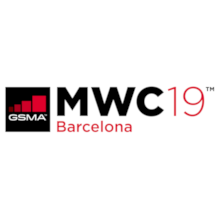 Besides our traditional SIM card offer, which is standardised for general IoT use cases, we are able to choose between 12 pre-negotiated carrier SIM deals to fit your specific market need. Take control over your SIM cards hassle-free with our self-service connectivity management platform called 1oT Terminal. It enables you to switch your SIMs on/off, set data limits, see real-time SIM sessions, set up notifications & alarms, and deploy many other value added services. 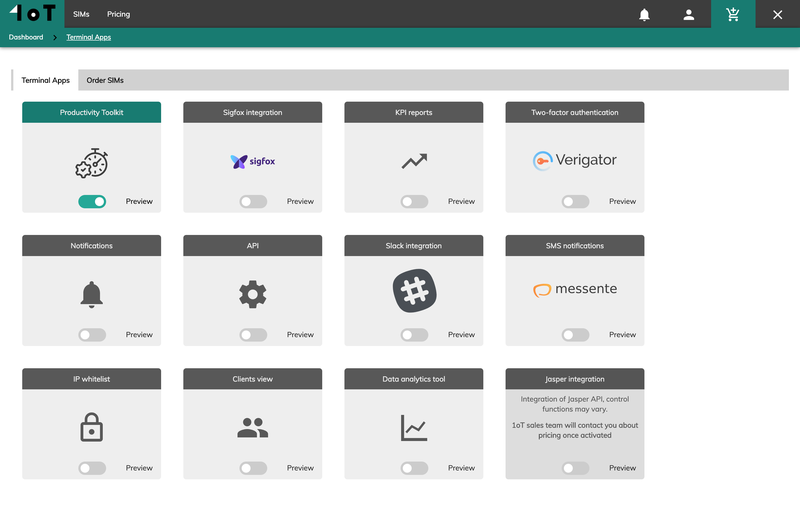 Plus, it comes with an API to manage it all directly from your systems and applications. Log in to our revolutionary eSIM management platform or use RESTful API for activating your new eSIM cards. 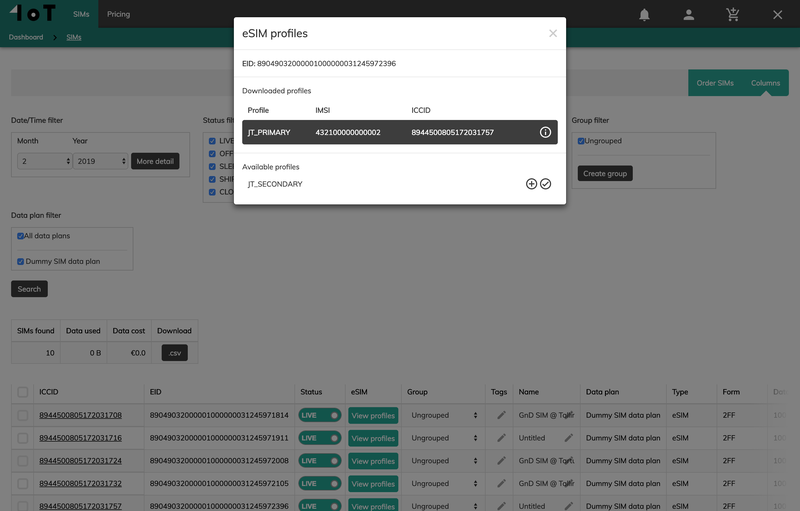 Our self-service platform is tailored for complete control over your eSIM inventory, turn your eSIMs on/off, set data limits, view real-time SIM sessions, set up notifications & alarms, and utilize many other value added services. Play around with multiple pre-negotiated carrier deals: swap, download, or delete your eSIM carrier profiles with a click of a button. Today this carrier, tomorrow someone else! All done on the 1oT Terminal platform or via API. Whether you are managing 100 or 100,000 eSIMs, our platform enables you to stay on top of the game and keep everything under your control with a notification system, bulk actions, & interactive reporting tools. Our platform comes with an extensive value-added toolkit making it way more than just an eSIM management infrastructure. 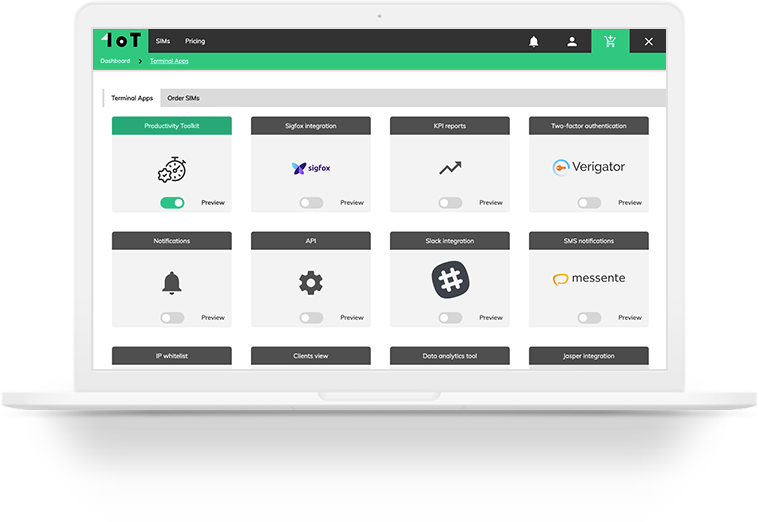 Build the platform you actually need by subscribing to value-added services like notifications feature, interactive reporting tools, Slack integration, extra security layers, etc. On top of that you can pre-load eSIM applications to enjoy the full potential of eSIM. let's build great things together! All new and something good for our SIM friends. Just click and read it!